Hello everyone, आज हम जानेंगे कि यदि आप professional blogging शुरू करने के इच्छुक हैं तो आपको किन-किन चीज़ों पर invest करना चाहिए? यह जानना आपके लिए बहुत जरूरी होगा क्योंकि, यदि आप सही जगह पर investment करते हैं तो आपका blogging career बहुत ही आसान हो जाता है. तो चलिए जानते हैं. Domain name सबसे पहली चीज़ है, जिसमे आपको invest करना चाहिए. जो फ्री blogging platforms होते हैं वो आपको subdomains के साथ blogs provide करते हैं, जोकि आज कल search engine से ट्रैफिक gain करने के लिए relevant नहीं रह गएँ हैं. तो यदि आप अपने blog से अपनी online पहचान बनाना चाहते हैं, तो आपको पहले एक top level domain name ही खरीदना चाहिए. एक domain name जितना आप सोचते हैं उससे भी कई कम दामों पर खरीद सकते हैं. मैंने अपना पहला domain name केवल 80 रूपए में खरीदा था और मैं आपको बताना चाहूँगा कि मैंने आज तक बहुत सारे domain names खरीदे हैं but कभी भी किसी एक domain name के लिए 300 रूपए से ज्यादा नहीं खर्चे. यदि आप directly domain name registrar जैसे की Godaddy, Namecheap इत्यादि website पर जाकर domain name खरीदना चाहेंगे तो आपको शायद इतना सस्ता न मिले. आपको उनके discount coupons और offers का benefit लेना चाहिए, जो time to time आते रहते हैं. यदि आप domain name खरीदते हैं तो आप उसे बहुत से फ्री blogging platforms जैसे कि Blogger के साथ भी use कर सकते हैं. Web hosting अगली जरूरत है. जैसा कि मैंने ऊपर बताया की आप अपने domain का use किसी फ्री blogging platform जैसे कि Blogger के साथ भी कर सकते हैं, परन्तु उसकी बहुत सारी limitations होती है. तो यदि आप professional blogging करना चाहते हैं और blogging से पैसे कमाना चाहते हैं तो आपको WordPress का premium platform चुनना पड़ेगा. Actually WordPress खुद तो फ्री है पर उसके लिए आपको web hosting चाहिए होगी. इसलिए आपको web hosting की जरूरत है. इसी कारण से web hosting हमारी investments की list में second number पर है. यदि आप WordPress को चुनते हैं तो इसमें आपकी मदद करने के लिए बहुत सारे resources available है, जैसे कि, ShoutMeHindi पर ही आपको WordPress से related बहुत सारे मददगार blog posts मिल जायेंगे. अब यदि आप ऊपर बताई गयी दोनों investments करते हैं तो ये काफी है. परन्तु अगर आपका बजट इससे भी ज्यादा है तो आप कुछ और investments भी कर सकते है जिनसे आपकी blogging journey और भी ज्यादा सरल हो सकती है. यदि पैसे की कोई दिक़्कत न हो, तो क्या क्या investments करें? जैसा कि मैंने आपको बताया कि आपको professional blogging करने के लिए WordPress का platform चुनना होगा तो अब उसमे आपको अपने blog के लिए theme भी चाहिए. वैसे तो बहुत सारी themes फ्री में भी available है किन्तु फ्री themes इतनी customizable नहीं होती कि हम उन्हें professional blogging के लिए use कर सकें. यदि आपका अच्छा बजट है तो आपको एक premium theme खरीदनी चाहिए. WordPress की power उसके plugins हैं. बहुत सारे WordPress के plugins फ्री हैं किन्तु बहुत सारे plugins ऐसे भी है जो फ्री plugins से कई ज्यादा powerful और फायदेमंद है, but आपको उन्हें खरीदना पड़ेगा, तो आप चाहें तो ऐसे plugins में भी invest कर सकते हैं. 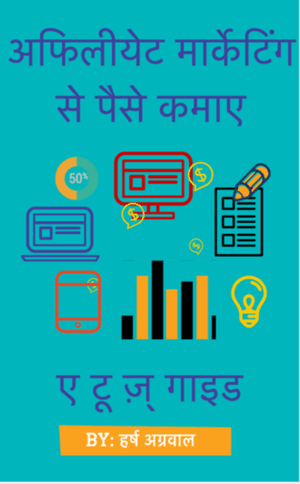 कुछ tools होते हैं जोकि आपकी keyword research, blog analysis और ट्रैफिक बढाने में help करते है, आप ऐसे tools पर भी invest कर सकते हैं. यदि आप एक busy person है, या फिर इतने योग्य नहीं है कि आप regularly quality content लिख सकें, जोकि blogging में बहुत जरूरी है तो फिर आप content writers को hire कर सकते हैं. Moreover और बहुत सारे काम होते हैं जो आप खुद नहीं कर पाते,जैसे कि theme की customization या फिर videos इत्यादि को edit करने के लिए जिनके लिए आपको freelancers कर सकते है . यदि आप शुरू से अपने blog को एक brand के रूप में बढ़ता हुआ देखना चाहते हैं तो आप advertsing का सहारा ले सकते हैं. जैसे कि आप Facebook advertsing को use करके अपने page पर likes पा सकते हैं. Similarly अपने twitter के followers बढ़ा सकते हैं और इस तरह social मीडिया पर अपनी पहचान बना सकते हैं. In Short आप नीचे दिए गए टेबल के हिसाब से अपने बजट के अनुसार investments कर सकते हैं. 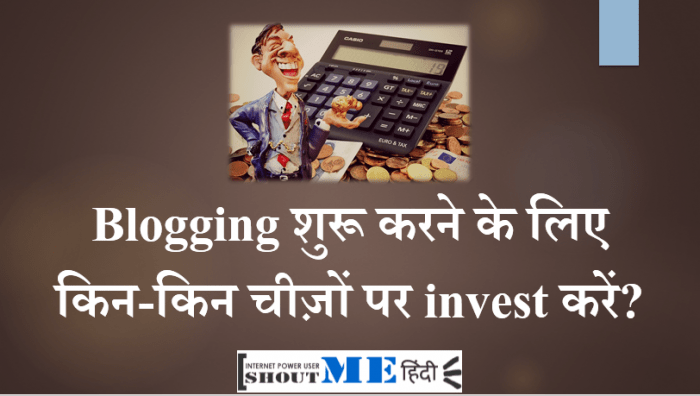 Budget Investment करनी चाहिए इन पर…..
2 यदि पैसे की कोई दिक़्कत न हो, तो क्या क्या investments करें? i want purchase hosting from hostgator for 3 blogs shared hosting. and also good premium theme for wordpress please provide me link. Ek baat main janna chahta hoon ki Hostgator Kya Rupay card ko support karta hain. Kyonki mere paas Rupay Card hi hain. Professional blog start karne k liye aaj tak ki sbse acchi post padi.. thank u..
bahut hi achhe tarike se aapne blogging investment ko btaya hai. Mai abhi blogger par hu. Mujhe wordpress par move karna hai. Thanks and Best of Luck for your Blogging Career. Great work. Bahut acchi information bataye hai aapane. naye bloggers ko bahut help hogi aapake information se. Apke bataye tools kafi ache hai bhai. Yaha tak investment ka swaal hai. Mere hisab se ek blogger ko startup ke liye domain name + web hosting toh lena hi chahye. starting me domain name se hi kaam chal jata hai. lakin web hosting se wordpress me shift karke apne blog ko ek profession look dena bhi jaruri hai. Aap ne bahot achi jankari share ke hai kayu ke kahi blogger hote hai to blogging ke starting mai confusion mai aa jate hai ke kon se chij par paise invest kare or kon se nahi..
Me abhi wordpress se free blogging kar raha hu..
me blog ke bare me pahle kuch nahi janta tha..
par Thanks to harsh Sir, unki wajah se muze bahot kuchh samajh aa gaya he..
par muze abhi bhi ek sawal he ki Kya mene WordPress se Domain kharida aur start kiya to muze Dreamhost ya aur websites se hosting khardni padegi kya hosting karne ke liye..
muze budget ki chinta nahi par kya mene sirf WordPress se Domain kharida to aur sirf use hi upgrade kiya to chalega kya? ya muze hosting kharidni hi padegi, ya phir me WordPress ke domain ko Upgrade karke chala sakta hu? ya muze wordpress se Web hosting mil sakti he kya? Muze sirf yahi confusion he, Please ho sake to kya aap jaldi reply karenge? And thank’s again to Harsh Sir and Gurmeet Sir aapko bhi..
Muze blogging me behtar banane ke liye. Thank you. Pehle toh aapko yeh decide karna hai ki aap WordPress.com par rehna chahte hai ya phir selh hosted Worpress i.e WordPress.org par shift hona chahte hai. Agar aap .com par rehna chahte hai toh aap appko bas domain change kar sakte hai. Hosting ki zaroorat nahi aur agar aap .org par move karna chahate hai toh aapko web hostinh kharidne ki zaroorat padegi. Sir I make my blog from blogger free plateform. Can I earn something from here from free platform.who? bilkul earn kar sakte hain. Use adsense, media.net or other ads. You can also use affiliate marketing. hello, mera ek question hai kya social media par advertize se google adsense par koi fark padta hai? mera naam paresh hai aur mene abhi ak naya blog banaya hai blogger.com pe aur vaisa hi blog wordpress pe banaya hai ab me sub domain ko hatana chahta hu to konse blog pe domain lagau wordpress achha rahega ki blogger kyu ki mera budget bahot hi low hai to kya me apni site ko konse blog pe lagau taki hosting ki jarur na rahe…..
please help me as soon as possible……..
Self hosted WordPress is best always. sir blog post me likha hua data aur image ko kase pata kate ki copyright hai ya nahi . Mostly data and images are credited. It’s always good to credit the author if you are copying. hello sir main ye janna chahta tha ki hum sceen shot lekar koi images apne blog me use karte hain ton copyright ki koi problem to nahi ayegi ? nahi, copyright problem nahi hogi agar aap koi screenshot ko lekar images ki tarah use karte hain. Kyonki Opera Browser me adblocker installed hota hai. Blogger par chahe aap koi bhi domain name register kar len, jaise ki onlycricketnews123.blogspot.com aur baad me to aapne apna domain name hii lga dena hai. Kya aap iske liye Gravtar use kar rahen hain? Sir, Yadi Mai Apne blog Mai, technical post kar Raha hu, to “domain ka Naam” technical keyword par hona chahiye?